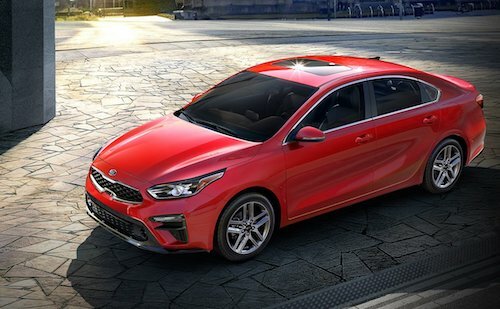 The new Kia Forte in Odessa, Texas is available in three body styles; the standard Forte four door model, the Forte Koup two door model and the Forte 5 five door hatchback. This sporty compact car is a popular choice for those who embrace technology. Loaded with innovative features like wheel mounted controls, voice navigation with audible turn-by-turn instructions, and a rear camera display system, the Forte offers much at the touch of a button. The Forte has also been recognized as one of the safest cars on the road and recently received a NHTSA 5-Star Crash Safety Rating. We have plenty of new Kia Forte models to choose from. You can browse our entire new Kia inventory online to see MSRP, MPG, color options, trim levels, vehicle details and photos. If you want to learn more about this exciting Kia compact car, stop by our dealership and test drive a new Kia Forte in Odessa, TX.